This is my very favorite oatmeal cookie. To make “Easy and Good Oatmeal Raisin Cookies” more wholesome, I sometimes use white whole wheat flour and evaporated cane juice sugar (organic sugar) – both of which can be found at mainstream grocery stores. White Whole Wheat flour is sold under the name “Ultra Grain” and made by Eagle Mills, while King Arthur makes their own white whole wheat. Evaporated cane juice sugar is a fancy name for less processed granulated sugar. If your store doesn’t sell it, try the local health food store. Preheat oven to 350 degrees F. Have ready 2 ungreased or parchment lined cookie sheets. Stir flour, baking soda, baking powder, salt and cinnamon together in a medium bowl; set aside. Cream butter and both sugars in a mixing bowl using high speed of an electric mixer; add egg and vanilla and beat just until egg is mixed in. Add the flour mixture to the butter mixture and stir just until mixed. Stir in oats, raisins and pecans. Using a tablespoon measure, scoop up dough and shape it into 1 ¼ inch balls; Arrange about 2 1/2 inches apart on baking sheets. Bake 12-14 minutes, one sheet at a time, on center rack. Remove from oven; let cookies sit on baking sheet for 2-4 minutes. Carefully transfer to a rack to cool. 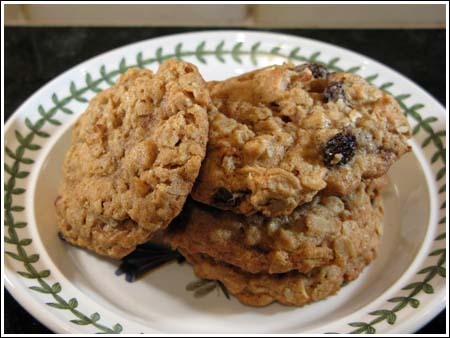 I have been looking for a crunchy Oatmeal Raisin Cookies recipe for years! Yours is perfect! It’s crunchy, delicious and will now be my only Oatmeal Raisin Cookies recipe! Thanks for being true to the description you gave when I was researching. I had a hankering for some oatmeal raisin cookies and found your recipe. They were delightful!! However I didn’t have brown sugar, so I used 3/4 cup of granulated sugar and 1/4 cup of maple syrup. DELICIOUS. Anna, these turned out great! We used currants…thought I had raisins on hand but the currants plumped up nicely. Thanks for the recipe! Thanks for this recipe– it’s really delicious!! I’m allergic to wheat, but can indulge in other gluten-ful grains, so I made this recipe with barley flour instead of wheat. I also used cranberries and chocolate chips in addition to raisins (about 1/4 cup of each to make up the 3/4 called for). I’ve found in wheat-free and gluten-free baking that whole oats just won’t hold the cookie together, so I’ve experimented with both quick cook and with chopping up old fashioned oats in a blender. Delicious both ways, but I prefer chopping up the old fashioned oats for a softer, chewier cookie. This is the first wheat-free oatmeal raisin cookie I’ve succeeded in making that holds together as a cookie and tastes amazing… though I have yet to get a gluten-free one to hold together. Thanks! Sue, thanks for trying those cookies! Today I finally got around to making these cookies. They are great!! Thanks for sharing yet another great recipe!! I made these yesterday, they sure are delicious! Great flavor and texture. Yum, the raw dough is extra scrumptious, too. I did put half a cup of chocolate chips in, instead of raisins – I’m just not that crazy about raisins, and well, chocolate chips go with just about anything. They taste great in these cookies, for sure. AND I got to try out my brand new air insulated cookie sheet! I don’t know if the cookies came out better, but it sure was nice to use a sparkling clean, flat pan that will be dedicated to cookies only! Dani, you could, but the texture would change. I kind of liked the butter here because it gave the cookies crispy edges and a good solid structure. Do you think you could substitute the butter with oil or applesauce to make them even more wholesome? Jill, thanks. This is all good information for me to take to the doctor tomorrow. Thanks for the help. Tram, yes. I am using it the same as I would regular flour. It weighs the same too. That is, about 4 1/2 oz (give or take a few grams). Do you find that you can use white whole wheat flour cup for cup in place of all-purpose? I am sorry to hear you are having eye troubles again!!! When you see the doctor check on the prescription drug Restassis. I know that is specificially for dry eye syndrome. I hope you can get in sooner than later. I remember my hubby having that…it is so irritating!!! Thank you for posting this recipe..looks so yummy!! You have evaporated cane sugar…is that the same as evaporated milk? I just need to clarify! I hope you get it all situated with your eyes! Sorry about your eyes! Hope you feel better soon. I think I might make these tonight. I have a bag of those jumbo raisins that I need to use up. The problem is, around here nobody appreciates oatmeal raisin cookies. Evaporated Cane Sugar is like granulated sugar but slightly tan in color. It’s supposed to have more nutritional value and it does seem to have a little more natural flavor. More and more stores are selling it, but if you can’t find it, just use granulated. Well, I like the icebox idea. Todd’s favorite dessert ever is probably that chocolate cookie & Cool Whip icebox cake. Thanks for the eye sympathy. I’ve been using something called “Systane” which seems to help a little. I’ve been hungry for oatmeal cookies lately and was considering making your Big Fat Maple Cranberry, Walnut,Oatmeal cookies. They’re sooo good! But, maybe I should give these a go instead.